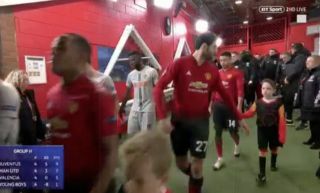 Marouane Fellaini may have been the saviour for Man United in the Champions League on Tuesday, but that didn’t stop him from embarrassing himself before the clash by losing his pre-match mascot! The Belgian, who scored the winner for the Red Devils in the 91st minute of their fixture against the Swiss side, seemed to lose his pre-match mascot just seconds before taking to the pitch on Tuesday night, a moment we’re sure he’s long forgotten about given the exploits he produced in the tie! United booked their place in the last 16 of the competition following Fellaini’s last gasp winner on Tuesday, something we’re sure all Red Devils fans will be happy with given how their season has gone thus far. Here’s a clip of the hilarious moment Fellaini lost his mascot just before stepping onto the field for United last night. We’ll bet the kid is willing to forgive him given the fact Fellaini ended up bagging the winner, though!